Blurb Description: The battle for the crown has begun, but which of the three sisters will prevail? I don’t know how to start describing a book that I devoured in two days straight. 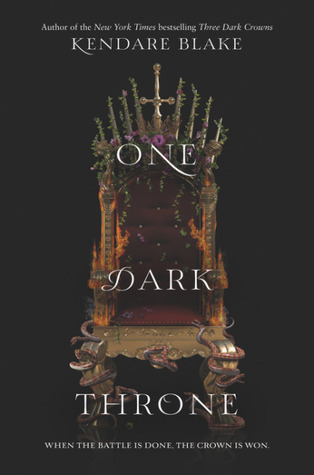 I just kept flipping page after page, desperate to know what would happen to the characters that I love, unable to put it down because One Dark Throne was JUST THAT GOOD. If you read its prequel, Three Dark Crowns, and found it slightly slow, it was because Kendare was giving you time to get to know everyone in this book before giving you the marvel that is One Dark Throne. For the most part, I absolutely LOVED how the plot built up. It was some genius plot and world building that had me filled with adrenaline in this fast paced magical wonder. The small chapters and the scheming and plotting on all sides was SO MUCH FUN to witness. I did, however, say ‘for the most part’. There was a point in the book where a duel between Mirabella and Katharine ensures when I realised that Kendare wasn’t ready to kill off her queens just yet and that put a dampener on the whole experience of a competition to the death for the throne. After that, I enjoyed the book, but not AS MUCH AS I PREVIOUSLY WAS. I’m also slightly upset that the two major plot twists that hit us in book one weren’t ACTUALLY HANDLED in book two but instead we were given vague half answers like ‘Only the Queen Knows Why’ and ‘Pietyr doesn’t need to know, but he knows what happened to Katharine.’ WHAT. EVEN. IS. THAT? I spent the majority of book one rooting for Arsinoe and Jules and all things Naturalist but I LOVE how Kendare managed to show you the good and the bad of all her characters so much so that I WAS SO CONFUSED ABOUT WHICH ONE I SUPPORTED? I honestly wanted all of them to hug it out and I also wanted to see one queen survive and I love that Kendare managed to change my perceptions because it made the book that much more fun to read. I adored all the secondary characters as well – Joseph, Sara, Bree, Nicolas, Billy, Pietyr, Luca, Natalia and everyone else. I felt like I knew them so well after book one and I loved it. Kendare Blake’s writing was simply and easy to read. Despite the fact that she was telling the story from SO MANY people’s point of view, she managed to make me feel the difference with each one of them. Third person and multiple points of view was the perfect way to tell a story that has so many sides and I loved it. I’d just about reached the halfway mark in this book before a fellow book lover told me that there were two more (I was under the impression that this was a duology) and that left me both happy and sad. 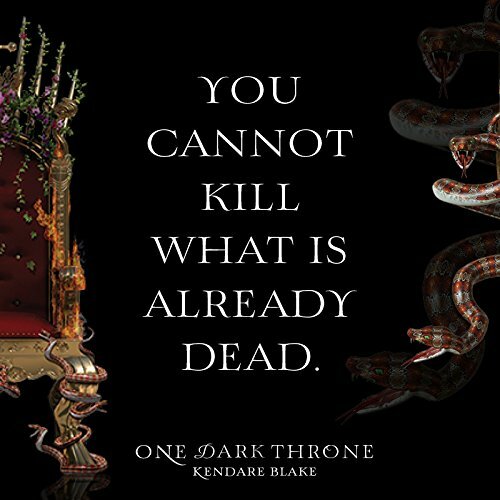 I LOVED ONE DARK THRONE. It was a well written, fast paced, dark magical adventure and one of the best fantasies I’ve read all year. 4.5 stars. Kendare Blake is the author of several novels and short stories, most of which you can find information about via the links above. Her work is sort of dark, always violent, and features passages describing food from when she writes while hungry. 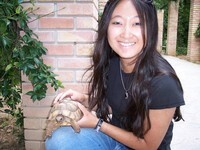 She was born in July (for those of you doing book reports) in Seoul, South Korea, but doesn’t speak a lick of Korean, as she was packed off at a very early age to her adoptive parents in the United States. That might be just an excuse, though, as she is pretty bad at learning foreign languages. She enjoys the work of Milan Kundera, Caitlin R Kiernan, Bret Easton Ellis, Richard Linklater, and the late, great Michael Jackson, I mean, come on, he gave us Thriller. She lives and writes in Kent, Washington, with her husband, their cat son Tyrion Cattister, red Doberman dog son Obi-Dog Kenobi, rottie mix dog daughter Agent Scully, and naked sphynx cat son Armpit McGee. 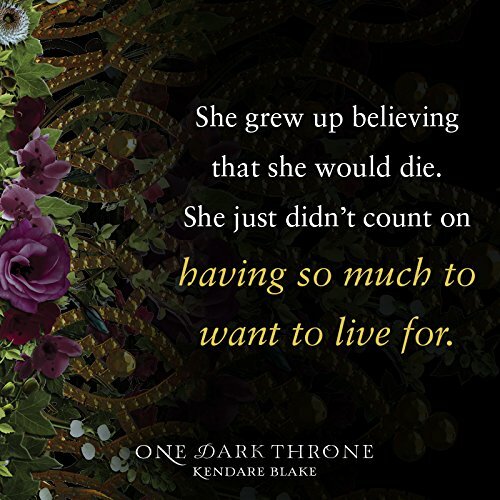 Have you had the chance to dive into the Three Dark Crowns series yet? What do you think of it? Which of the three Queens do you support? Which of the three powers would you like to have - Elemental, Poisoner or Naturalist?